I popped into Accessorize by Monsoon this past weekend and admired their many lovely sale items until the broken jewellery box caught my attention. Having always been a lover of a fixer-upper project, I carefully looked at every single broken item in the box until I had settled on 11 little plastic bags with jewellery parts within. 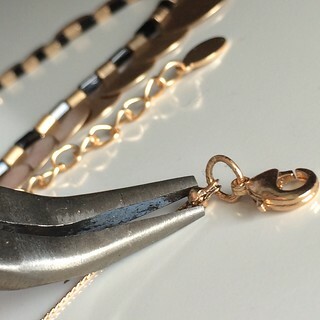 Eleven new fixer-upper jewellery pieces to mend or reinvent! I’ll be writing about each of these projects separately since that gives me time for each bag/project and with each being so different a nice chance to really consider what to do creatively. Oh, the price? I bought €296.60 worth of broken jewellery for €11.10. Yes, a little bit epic, isn’t it? 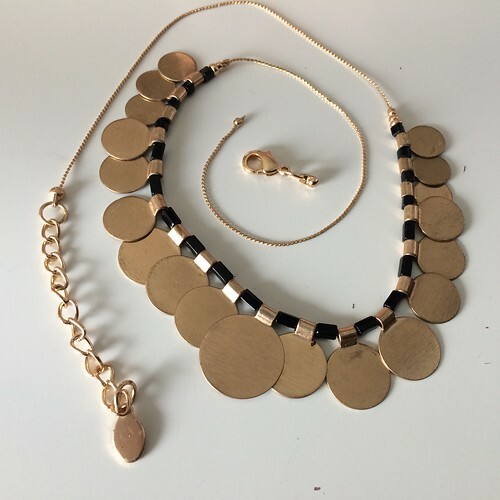 For the first post, I’m writing about the Beaten Gold Coin Necklace, which I think looks like something Cleopatra would wear so I’m nicknaming it the Cleo Necklace. 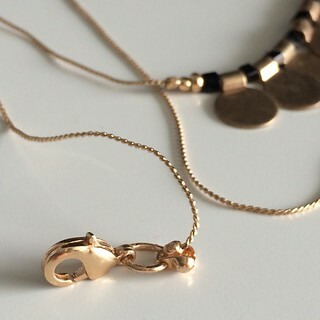 It cost €1 (originally €9.90) and the necklace itself had come away from the clasp. A minor repair, but not one a busy accessories store can take the time to address so my gain! 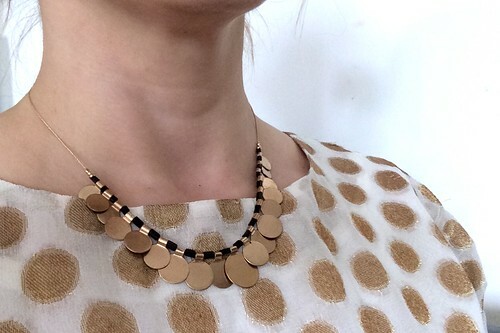 I first made sure there were no other issues with the necklace, which there were not. Then I made sure the two parts of the clasp that need to fit back together were clean without lint. All good. I placed the tiny ball at the end of the necklace chain/cord into the open piece on the clasp element and added one drop of superglue then quickly used my tiny pliers to cinch the piece together, holding the ball inside. I held firmly for 10 seconds then let it dry untouched for the rest of the day. What have you mended lately? Any great finds in the July sales? Did you know this is my 400th published post on EvinOK.com (since March 2011)? Very exciting! Here’s to the next 400. This entry was posted in Jewellery | Beadwork, Make Do and Mend and tagged 2015 Monsoon Sale, costume jewelry, repairing jewelry. This is amazing! That is some saving on necklaces. I’ve a beautiful necklace that I bought from a craft store – it’s handmade but the links have eventually all fallen off, but I’m determined to mend it. Where would I find those link bits though? Awesome find and salvage! That is such a versatile piece. You can dress it up or wear casually every day. I have dabbled in making jewelry, knottong pearls, viking knit pieces (wire) and repairing some pieces I’ve owned for a long time. I can’t wear costume jewelry as the metals make me break out in blisters so all my metals have to pure gold or silver. So repairing skills are a girl’s best friend! I’ll likely sell or gift a few of them since there are A LOT of pieces and only one me. Repairing skills are indeed a girl’s best friend, Bonny. You are so right!! !